The first range named SPECTRE, after the new movie, will be made up of traditional leather goods, bags and suitcases – in navy and black with brass hardware. The range comprises the following items: 16″ Slim Attaché, 18″ Trolley Case, 21″ Trolley Case, 30″ Suitcase with wheels, a canvas and leather Overnight and Wash Bags, Leather Passport Holder, Billfold Wallet, Coat Wallet, Business Card Holder, Travel Wallet and Luggage Tag. 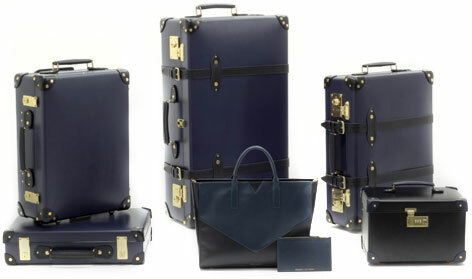 To complement this range Globe-Trotter will also introduce a range of women’s bags and accessories. Globe-Trotter Designer Charlotte Seddon worked closely with Jany Temime (Costume Designer, SPECTRE) on the female range, which has been named “Moneypenny” in honour of Miss Moneypenny. Charlotte has chosen buttery, soft Italian calf hide. The designs are centered on the cornerstone of the Moneypenny range: the ladies’ Business Bag. This bag (in navy and black leather) features various pockets for phones and tablets, and is also fitted with a leather covered charger unit which can be removed for easy charging. The Moneypenny range also features a Tote Bag made in the same leather as the Business Bag, a black and navy Fibre Board Vanity Case, Tablet Cover, Phone Pouch and Purse. Each piece in the Moneypenny range has subtle ‘M’ logo stitching. If any of the products will be see in SPECTRE is not yet officially announced, but it is very likely that the brown suitcase, seen on one of the recent promotional images, is a Globe-Trotter case. 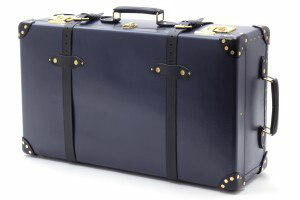 UPDATE: The Globe-Trotter Original Brown suitcase can be seen in the film. James Bond and Madeleine Swann in SPECTRE. 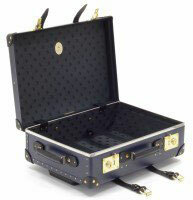 Bond's case looks like a Globe-Trotter Original Brown suitcase. Both ranges will launch in Globe-Trotter’s flagship store in London on Monday 12 October, 2015. Products will be available from the London Flagship store on Albemarle Street in Mayfair and other selected stores including Harrods. Selected items will also be available online through the 007store.com website and the Harrods website. This is not the first collaboration of the luxury luggage brand with Bond: in SkyFall, a Globe-Trotter Stabilist case was used by villain Patrice to carry his sniper rifle. A special SkyFall range of products was released in 2012, including bags and leather accessories, some of which are still available on 007store.com.